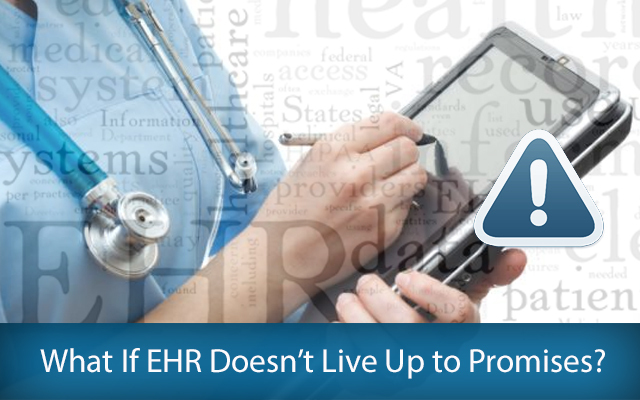 What If EHR Doesn’t Live Up to Promises? Many doctors upgrade from their paper patient records to store, manage and access the data in a smooth and convenient way. The federal mandates also require medical practitioners to use electronic health records (EHRs) to avail several incentives. The growing popularity of EHRs has further encouraged many companies to launch new systems with additional features and functionality. But many EHR models become obsolete within few months of their release due to rapid change in technologies. A number of doctors also hesitate to use EHRs due to lack of adequate support from the provider, and compliance issues. According to a report posted on Ehrintelligence.com, “Failed EHRs are a growing concern for providers. A white paper by Coker Group and Greenway Medical Technologies states that half of EHR systems sold today are intended to replace unsatisfactory software, up from 30% last year, and many practices are changing their systems due to compliance issues or discontinued packages. For some companies, discontinuing a system is simply cheaper than trying to revamp it, leaving practices to choose between significant migration fees or searching for a new EHR provider all together.” EMR EHR Software development thus is picking up steam. A medical practitioner has a number of options to replace his existing EHR system, if it does not live up to promises. Along with installing another EHR that meets the compliance requirements, you can also consider some of the meaningful alternatives to electronic health record keeping systems. However, you must keep in mind certain points, while transitioning to a new EHR system. When you prepare a proper strategy to choose the right EHR system, it will reduce the operational costs, and improve your productivity while making you eligible for government incentives. Time Required for Implementing the New System: You have options to choose from a variety of EHRs to suit your specific needs and budget. But you must remember that transitioning to a new system often takes times. So you must prepare a schedule to incorporate the advanced features and technologies. You can a save time by upgrading your existing system through additional development and remediation. Once you decide the timeframe to implement the new system without affecting the way you manage the valuable health data of your patients. Option to Integrate with Other Systems: Often your EHR system has to be integrated with other systems to get better results. Also, the EHR system that can be integrated with other seamlessly will make it easier for you to overcome certain performance issues. You can easily integrate the EHR with any internal or external infrastructure to avail the advantages of the advanced systems available in the market. Further, the feature will help you in using the same EHR system over a longer period of time by connecting it with advanced devices and solutions. Amount of Training Needed to Use the New EHR System: Often people need specialized training to use a new system smoothly. Also, your employees will need guidance in the initial stages about various aspects of the new EHR system. So you must consider the amount of training required to help your staff in seamlessly using the system. Based on your choice, you can train your employees in a number of ways. You can always ask the vendor to conduct training sessions to explain your staff about the features and functioning of the new EHR system. Also, you can include the EHR training as part of your employee induction process to properly prepare the new employees. Constant Support: Unlike other information and data, the medical history and health information of your patients are very crucial. In case your EHR system does not operate for a few minutes, it will have a huge impact on your professional reputation. So you must buy the new EHR system from a vendor that offers immediate support to resolve the issue. At the same time, you can also evaluate the information collected from various sources to determine if the provider is concerned about your issues, and how he responds to your service requests. You can always improve your productivity if the vendor provides you quick solutions along with suggesting the best alternatives. Many experts even recommend medical practitioners to consider several meaningful and inexpensive alternatives to the EHR systems available in the market. You can even consider using some of the inexpensive and less-disruptive IT components to avail the advantages of an EHR system. It is also advisable to choose an EHR system that does not offer you loads of features, but it is customized to meet your specific needs. We provide Healthcare software development services. If you would like to know more about our certified Healthcare software developers, please get in touch with us at Mindfire Solutions. This Post was posted in Health Care and tagged healthcare mobile app development, healthcare software development, Healthcare software development services, healthcare software integration, healthcare software testers, hire healthcare developers, hl7 interface development services, iphone healthcare app development, iphone medical app developers, Medical Software development, mobile health app development, mobile healthcare application development, mobile medical app developers, offshore healthcare development, offshore healthcare software development, online patient portal development, outsource healthcare testing services, pms integration services. Bookmark the permalink.